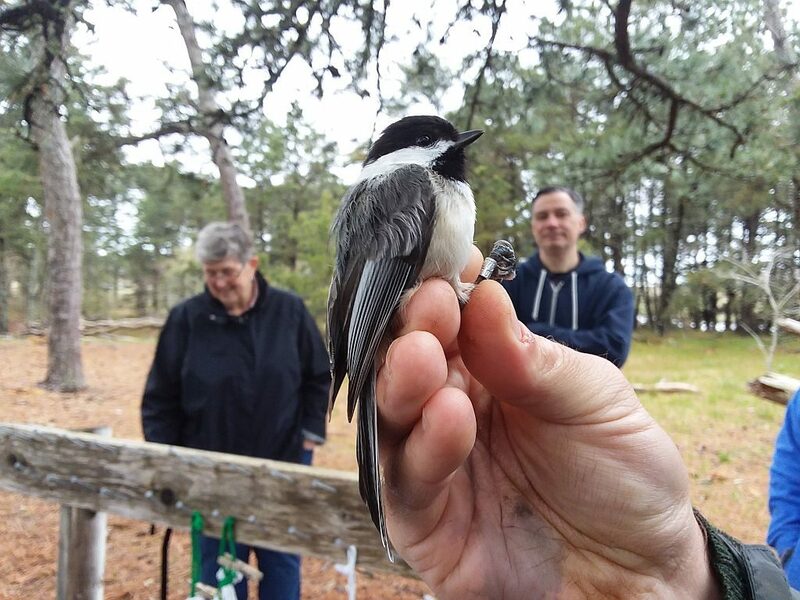 Wellfleet Bay’s bird banding operation hit a modest milestone last September, marking its fifth fall migration since it set up shop in fall of 2014. After a hiatus of about 30 years, mist nets returned to Wellfleet Bay in September of 2014. We realize that for bird monitoring 5 years is still very much a blink of an eye compared, say, to a period of 30 years. But in that relatively short period time hundreds of school kids and adults have had the chance to watch wild birds and the people studying them at very close range. But here are some things we can state with certainty about last fall: Banding manager James Junda and his team captured 2,083 birds, nearly 1,500 of them new birds. 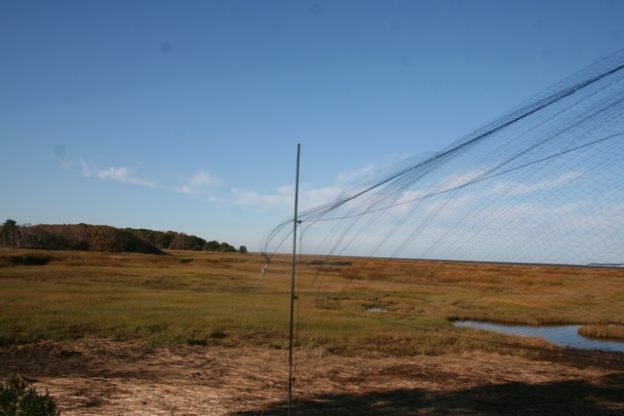 Seventy-four species were netted, the second most since the first banding session in fall of 2014. 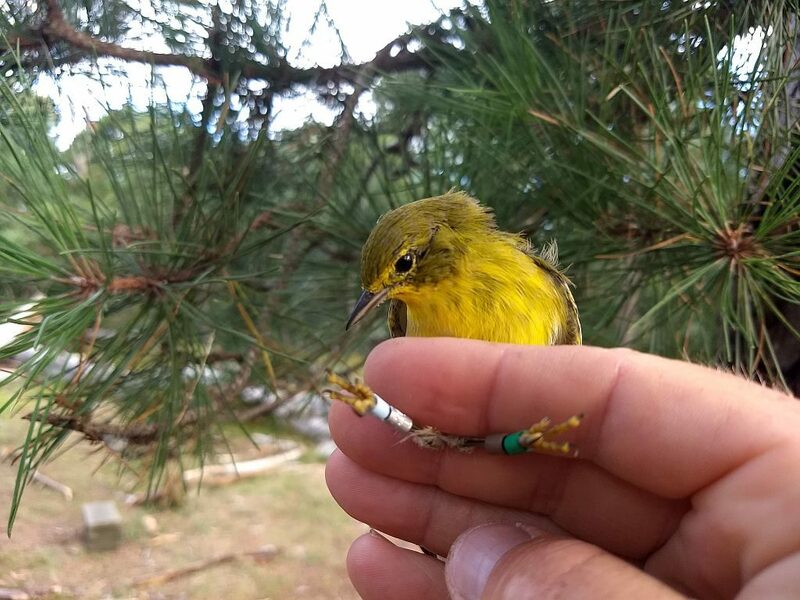 -Pine Warblers apparently had a great breeding season in 2018. Note the color bands on this bird’s legs. The bands are used to re-sight breeding birds being studied at the sanctuary. 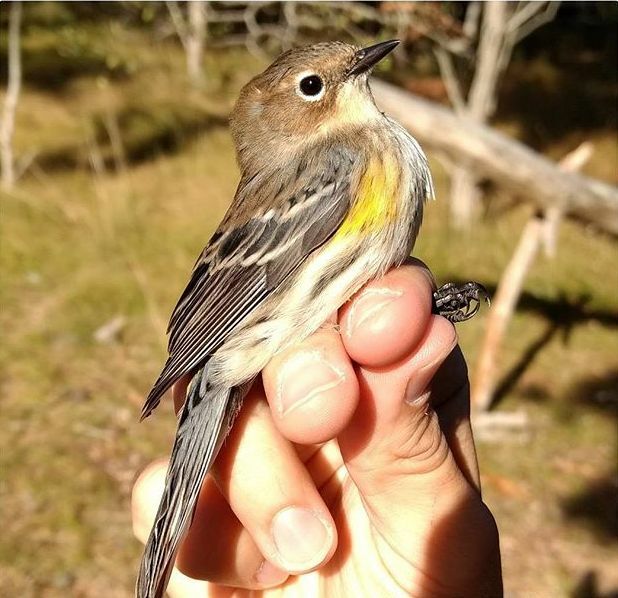 Pine Warblers, which breed on the sanctuary and elsewhere in the region, had a huge year—325 birds compared to only 32 in 2015. James says the addition of a new net in Pine Warbler- preferred habitat on the sanctuary may be partly responsible for that strong showing. One of the challenges of drawing conclusions about bird abundance over short periods of time is the impact of weather. Cold fronts that overlap with a given species’ migration window can influence what kind and how many birds you capture among years. We saw our greatest diversity of species—a total of 42– during a prolonged period of cold fronts with northwest winds in the second half of October, right smack in the middle of peak migration for kinglets and sparrows. Swamp Sparrows managed to make our top ten list with about triple their usual numbers and there was a similar increase for Ruby-crowned Kinglets, White-throated, and White-crowned Sparrows. (In fact, White-crowned Sparrows were 5 times more numerous last fall than in all previous years combined!) 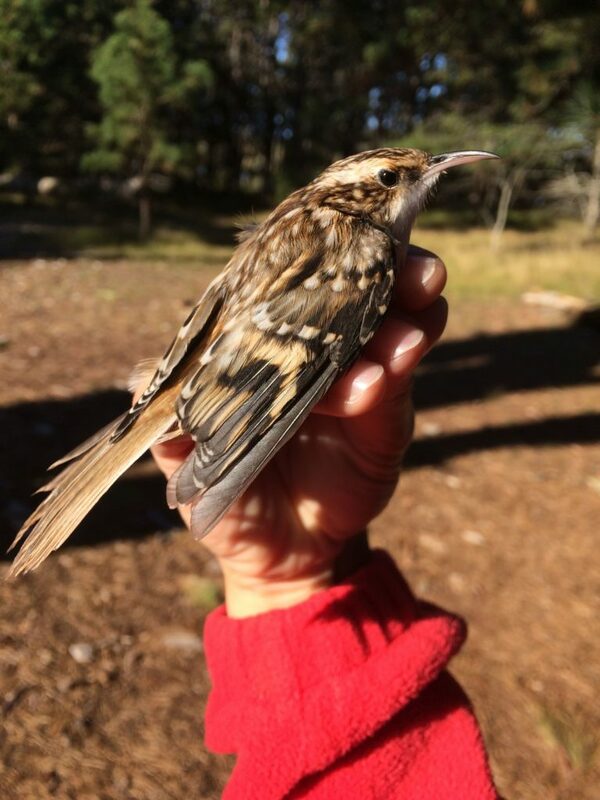 The delightful Brown Creeper, also an October migrant, ranked 12th on our list, with 42 captured. Note the curved bill on the Brown Creeper, perfect for grabbing insects and spiders from the furrows of tree bark. These birds are almost impossible to see as they hunt on a tree trunk. But some familiar fall birds were relatively scarce. We logged far fewer American Goldfinches—75 compared to 171 in 2017—and Yellow-rumped Warblers were down, with only 34 captured last fall. We had over a hundred of each species the previous two years. Where were these guys last fall? Yellow-rumped Warblers or Myrtle Warblers are one of the most common fall migrants on the Cape. They’re the only warbler that overwinters here in significant numbers. The banding station’s fifth anniversary was marked by at least one celebratory moment. The first chickadee banded here in fall of 2014 was recaptured. It was fun to see this old friend still alive and well! This bird clearly calls Wellfleet Bay home. It was first banded when the station opened in September of 2014 and as of last October, it was still here and looking great. This entry was posted in Updates on March 23, 2019 by Wellfleet Bay.